Protect your kids from smartphone addiction and inappropriate contents. MobileFence is a leading parental control app for Android. Help your kids build healthy habits by monitoring all of their online activities, such as apps, websites, SMS text, and even location. MDM(Mobile Device Management) solution. Help your kids enjoy their mobile device safely. Parents are always concerned about how much their kids are on their smart devices and what they're doing with it. Mobile Fence™ provides parents with functions to block apps and unsuitable websites, set daily device time, plan weekly device time, monitor location, and set Geo Fence to help kids safely and moderately use their smart devices. Can Mobile Fence be used by schools and companies? Mobile Fence dynamically blocks access to inappropriate Internet websites and applications based on parent-designated limits. 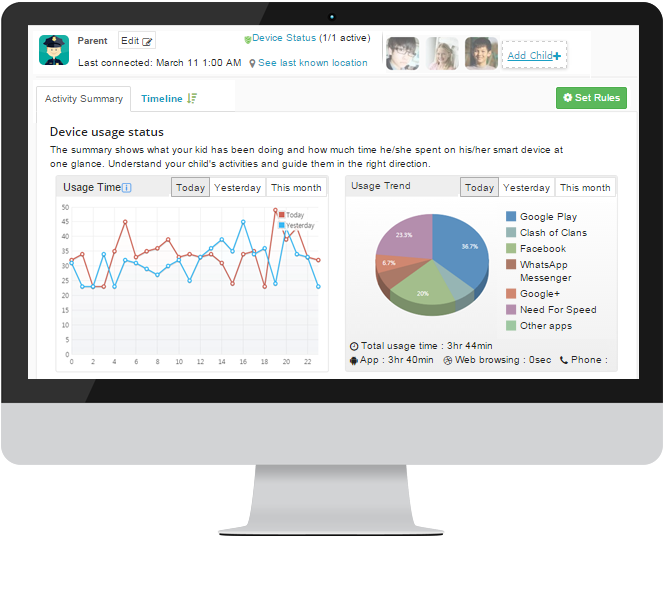 Parents can also set daily device time to regulate their kid's smart device use. Parents consistently worry about where their kids are. 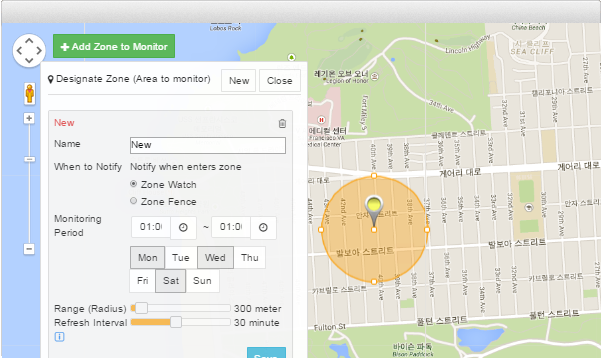 The Geo Fence feature alerts parents when their kid enters or leaves the designated zone. 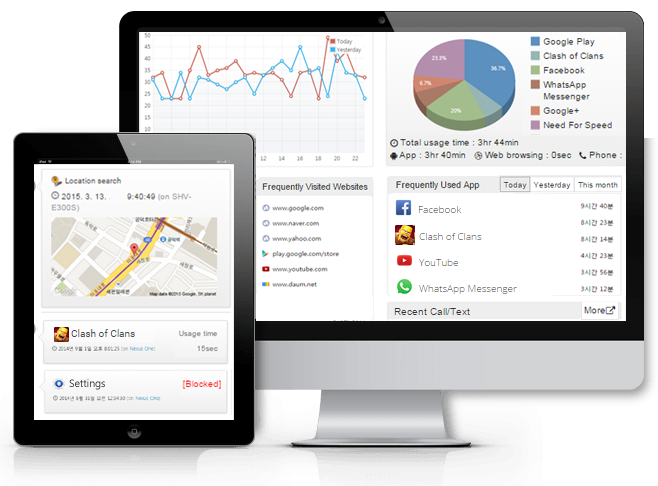 List of launched apps, usage time, visited web sites, and calls/texts (SMS) are reported on real-time. Parents can utilize the report to set-up a moderate rule for their kids' smart device usage. If you're worried about your child playing games all day, set a daily time limit on apps and help your child focus on more productive activities. 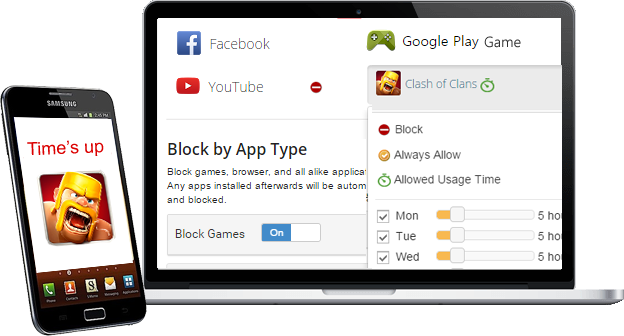 Access to inappropriate apps can be completely blocked. To help your child to safely browse the Internet, you can block access to harmful contents, such as adult/gambling websites, and check list of websites they visited. Even at this moment, Mobile Fence is analyzing hundreds of thousands of websites and categorizing it into the database. 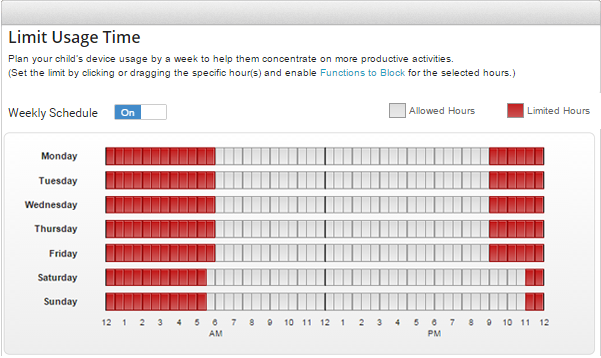 Plan a specific time limit for each day of the week to prevent your kids from late-night games and web browsing. You can also set rules during school hours. By immediately notifying parents when their kid enters or leaves the designated zone, parents can observe their kid's location and ensure their safety. 1) Install Mobile Fence app on kid's smartphone or tablet. 3) Link your kid's phone to Mobile Fence. Parents can view list of apps installed on their kids' devices and selectively block unwanted apps or limit usage time. Notifies parents of websites their kids visit and blocks harmful sites to let kids safely use the internet. When a child receives text messages that include keywords designated by parents, it immediately sends notifications so that parents can be aware of possible school violence or bullying. By utilizing GPS and network, Mobile Fence constantly updates the kid's current location to the parents. Geo Fencing immediately notifies parents when their kid enters or leaves the designated zone (school / after school program / danger zone). By receiving reports on what your kids do on their smart devices and how much time they spend, you can discover and improve your child's usage habit. By setting a specific time limit for each day of the week, you can prevent your kids from overusing their smart devices. 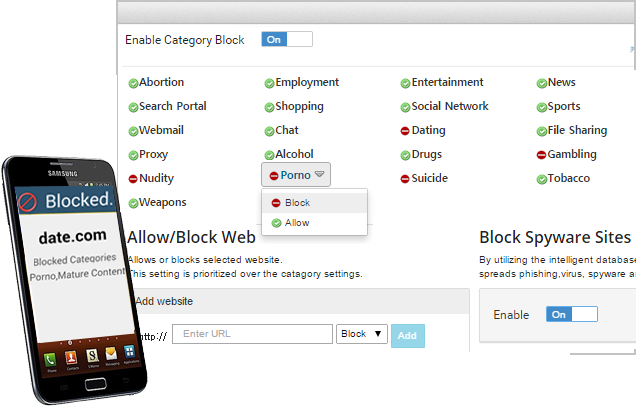 Functions to block camera, WiFi, Bluetooth, incoming/outgoing calls, specific phone numbers, etc. If the device cannot be found, you can lock the screen with a password or perform factory reset to protect personal information such as phonebook and pictures. Parents can block certain numbers to prevent exposure to unrecognized international or inappropriate calls. If a smart device is lost, GPS accurately detects and provides the current location of the device. Promotes trust between parents and kids by completely revealing the settings and limits set by the parents to the kids. Mobile Fence is MDM(Mobile Device Management) solution which provides protection/management/supervision functions for smart devices. Mobile Fence can not only be used by parents, but also by any group of individuals who need to control and limit device usage. [Schools] Block students' access to non-educational websites, games, YouTube, and device settings on school-owned tablets. [Companies] Block irrelevant applications on company smart devices and if lost, you can remotely delete data to protect stored customer and internal information.